A creative career can be a lonely affair. The painter works solo and so, for the most part, does the writer. Even when works are co-written, there are long hours of solitary work to be done. Music is often collaborative, but only after many, many hours of practicing alone. A supportive husband or wife can make all the difference. 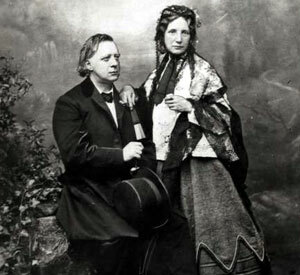 Harriet Beecher Stowe and her supportive husband, Calvin. The classic story of the consequences of an unsupportive husband is Charlotte Perkins Gilman's "The Yellow Wallpaper." A woman, suffering from depression after the birth of her daughter, is told by a physician to concentrate on domestic affairs and "never touch pen, brush or pencil as long as you live." Her husband enforces the doctor's orders, locking his wife in a room when he goes off to work. The "rest cure" drives her mad, as she imagines herself trapped in the hideous wallpaper of the room. Denying your creativity can drive you crazy. Ironically, Gilman was the grand niece of Harriet Beecher Stowe, who had one of the most supportive husbands in literary history. In 1840, Calvin Stowe wrote to Harriet, "my dear, you must be a literary woman. It is so written in the book of fate...Make all your calculations accordingly." Lucky for him he did push her to write. Harriet helped support her family with her writing even before her phenomenal success with "Uncle Tom's Cabin." Continually goaded by her husband, she wrote well into her nineties. The Stowes' progressive ideas about marriage -- and women succeeding in a creative career -- certainly were not in vogue during the pre-feminist Fifties and Sixties when I was growing up. A woman's place was in the home and not off pursuing a creative career. I was told I should learn to play the piano to soothe my husband's nerves when he came home for work -- not to embark on a concert tour. Still, even in unenlightened times, there have been mates around who supported the creative careers of their partners. When Julia Child's late-in-life career as an author and TV personality took off in the early Sixties -- her book was pubished when she was 49, her TV show, launched when she was 51 -- her husband, who was then nearing 60 himself, happily let her bathe in the limelight. More than just providing emotional support, he became her manager, supplying the photographs and illustrations for her books, testing and tweaking her recipes, proof-reading her manuscripts, hauling equipment, washing dishes, running errands, handling her fan mail, writing her books' dedications and shoring her up during her publicity tours and speaking engagements. He was often seen walking just steps behind his towering wife. "Julia swept into the lobby of La Trémoille, my hotel in Paris. And as she swept, she knocked against the bouquet of flowers on the tall pedestal at the door. It tipped. I gasped. Behind her, Paul Child caught it mid-topple and set it straight. What a team, I thought. Not only did they adore each other, but Paul was always there, seemingly content to swim in her wake, picking up whatever she might bowl over in her exuberant passage through life." Abstract painter Carmen Herrera also benefited from a supportive mate. For years her husband, Jesse Loewenthal (he's mentioned as a fellow teacher in Frank McCourt's memoirs) financially supported her life as a painter. He moved to neighborhoods that were cheap and sometimes dangerous, "so I could have room to paint," says Herrera. He talked to her about her work. But most importantly, he gave her the emotional strength to continue to create. "It's not always easy being an artist," she says in the uTube interview below, recalling her husband's support. She painted for almost seven decades. She had a few exhibitions, but her work fell under the radar. She had three strikes against her. She was Cuban, a woman and a minimalist painter in the competitive New York art world. But her husband never lost faith in her work. He didn't live to see her phenomenal success. Six years ago, at 89, she finally sold her first painting. Recognized as a master of abstract minimalism, her paintings hang at the Museum of Modern Art in New York, the Hirshhorn in Washington and Tate Modern in London. They sell for up to $50,000. And at 95, she's still at work.